Lunch time never has to be boring again with these Moroccan Chicken Flatbreads. 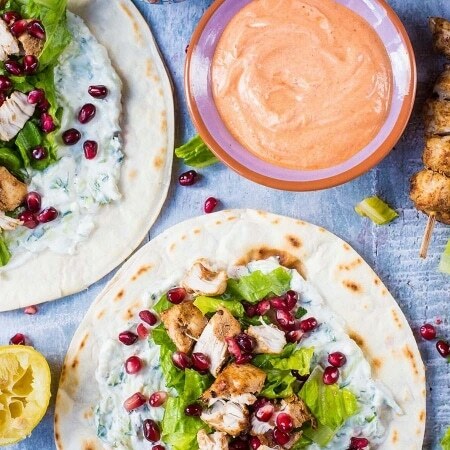 Spiced and succulent chicken skewers on a homemade flatbread with shredded lettuce, creamy tzatziki and a harissa yoghurt sauce that has a serious kick to it. Great for cooking on a BBQ too and feeding a crowd. Not to boast or anything, but this might just be lunch perfection. Don’t you think that everything tastes better when cooked on a skewer? These are really easy to throw under the grill or pop on to the BBQ and they pack up easily for a lunch on the go. Warning: you will want to make them again for dinner, and there is no shame in that! I am sure we could all do with new ways to cook chicken. We kept the seasoning simple and just used store bought ras-el-hanout. Not heard of it before? It’s a North African spice mix that means “head of the shop”, which basically means top shelf. So it’s the best of the best when it comes to spice mixes. It is made up of cumin, cinnamon, cardamon, ginger, nutmeg, paprika, chilli and so much more. All of the best spices go in to making this mix and you can usually find it pretty easily in the world food aisles of supermarkets. This recipe developed out of my obsession for ras-el-hanout, when I was looking for a way to make chicken skewers a bit more exciting. I thought I would mix it with yoghurt and marinate the chicken in it, like I do with Indian chicken skewers and it worked just as well. By the way… there are loads more chicken skewer recipes here. We have been on a bit of a homemade bread mission lately and that led us to making the perfect flatbread. It’s a little bit crispy on the outside, but light and fluffy inside. You can of course buy some flatbreads, but these are so simple and take no time at all to cook. It’s definitely worth it. This chicken recipe isn’t spicy at all and it’s all about herbs, spices and flavour rather than heat. But, that’s not to say you couldn’t mix some chilli in with the seasoning it you didn’t want it hot. But, we have served ours with a spicy sauce. 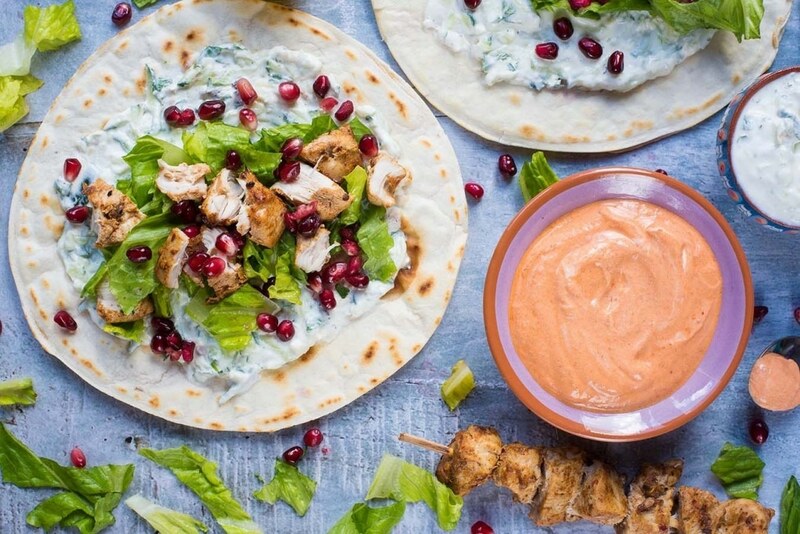 The harissa yoghurt sauce definitely has a kick to it, but the tzatziki and pomegranate cool the whole thing down and balance it out. Notice how I could have easily sprinkled some feta on to this. But I didn’t! Apparently, not everything has to have feta on it. Who knew! This is a pretty filling meal when served on a flatbread. But, if you wanted something else, or you are serving this up to a crowd, then a big bowl of couscous and some roasted vegetables. We put these under the grill to cook, but that doesn’t mean you can’t cook them on the BBQ too. Cooking times will vary, but as these are good for feeding a crowd, it means they would be perfect on the BBQ. You can just put the sauces, salads and flatbreads out and then cook up a huge batch of chicken and let people build their own flatbreads. Our Moroccan Chickpea Stew is a really warming and comforting stew, and the basic recipe is vegan. If you have any of this chicken leftover, then add it to the chickpea stew. It’s a great way to use up leftovers. The chicken itself isn’t spicy, but you can add some chilli flakes to the seasoning if you want it hotter. We did serve this with a spicy harissa yoghurt though. You can cook the the chicken under the grill, or put it on the BBQ. Got any leftovers? Add it to our Spicy Moroccan Chickpea Stew. If the chicken flatbreads by themselves aren’t filling enough for you, then serve them with some couscous and some roasted vegetables. Lunch time never has to be boring again with these Moroccan Chicken Flatbreads. 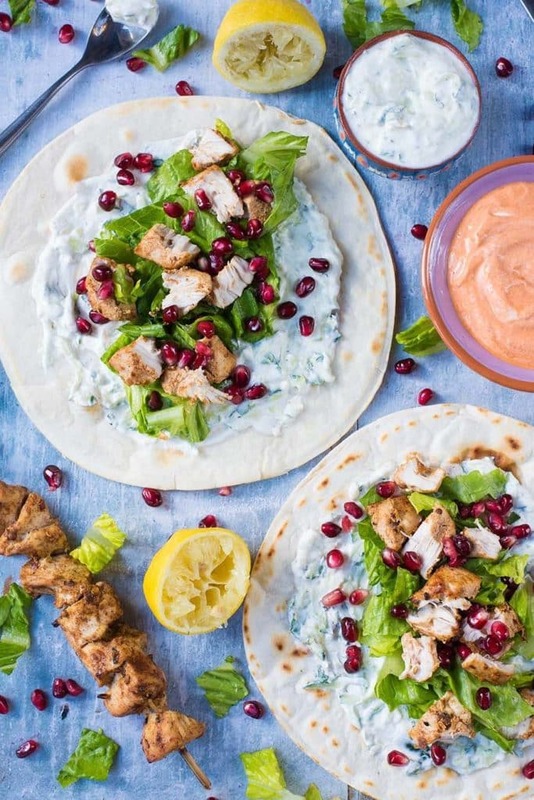 Spicy and succulent chicken skewers on a homemade flatbread with shredded lettuce, creamy tzatziki and a harissa yoghurt sauce that has a serious kick to it. Put the chicken, Greek yoghurt and ras-el-hanout in a bowl and mix well. Put the bowl in the fridge and leave for 30 minutes. Thread the chicken on to skewers (if using wooden skewers, make sure you soak them for 30 minutes first, so they don't burn) and put them under a medium heat grill for for 20 minutes, turning half way through. Check that they are fully cooked, as cooking time will vary depending on the size of the chunks. Put all the ingredients for the tzatziki in a bowl and stir well. Put the yoghurt and harissa in a bowl and mix together. 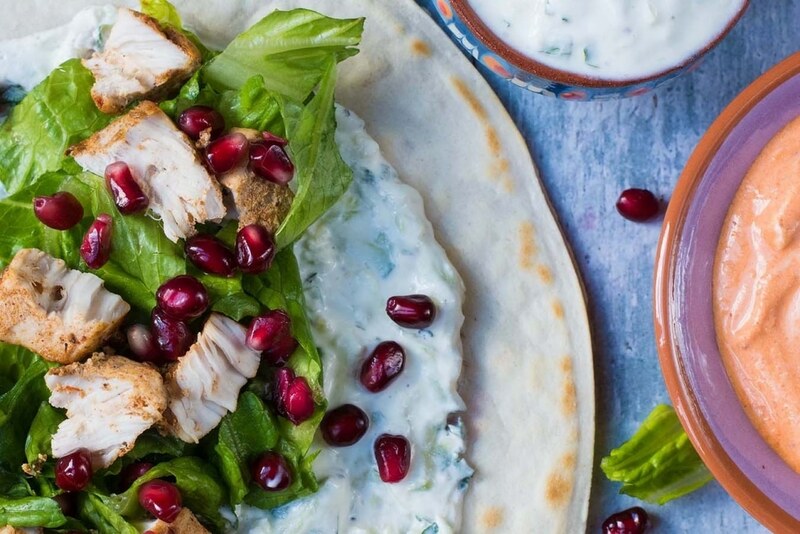 Spread some tzatziki on each of the Flatbreads and top with shredded lettuce and some cooked chicken and then sprinkle with pomegranate and harissa sauce. Looks good! The addition of pomegranates make all the difference in my books. Love your photos, these flatbreads sound fantastic, I’d love to try these. I love how vibrant these flatbreads look with all that colour. Moroccan flavours are delicious. You’re so right that everything tastes better when it’s cooked on a skewer 🙂 I love harissa with yogurt and this whole thing sounds wonderful! I love everything about these flatbreads… they look so flavorful and perfect. And your photos are so gorgeous!! Those colors!! His flatbreads look absolutely perfect and so do these flatbreads. I love the spice profile of the chicken and would be happy to dive into this meal any night of the week. This looks absolutely amazing! I can almost taste all the spices! I love tsatziki and I love pomegranate. Never thought to combine the 2. Yum! This looks so incredibly tasty and something my family would probably love. I am totally going to pin this! 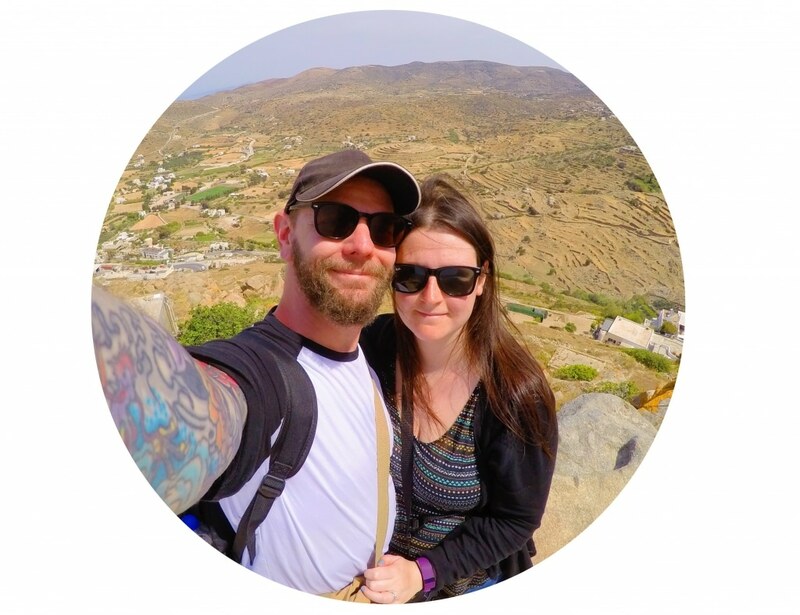 We’re on the same internationally inspired skewer page today! I do think everything tastes better on a skewer, and these are next up on our holiday weekend menu! This looks like an easy, light, and delicious lunch! These colors are gorgeous. This recipe looks and sounds amazing. I need to try it soon. How yummy!! Looks easy & satisfying! This is exactly my kind of meal. I would add some peppers and onions to the skewer, but they look amazing. Great recipe Dannii! How spicy is this? I had never heard of harissa before, but I bought some yesterday to make this and the packaging is a big vague. I just can’t get enough of your recipes. They are beautiful to look at for a start, but I have never been disappointed with anything I have made. I can’t wait to try this next. We love flatbreads too, they are perfect for lunchboxes . Add the ras-el-hanout spice must have made your dish very aromatic.